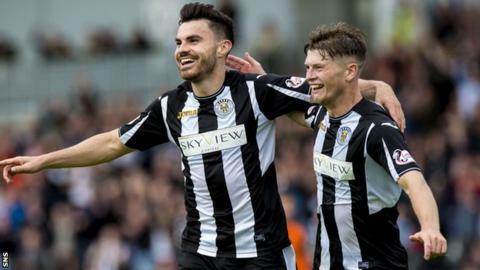 Lewis Morgan's double helped St Mirren end Dundee United's winning start to the Scottish Championship season. The 20-year-old fired in the opener from outside the box after 26 minutes, before the Buddies twice struck the woodwork. Morgan doubled his side's lead three minutes into the second half with a curling effort into the bottom corner. And former Ross County midfielder Ian McShane's first St Mirren goal sealed the win with 12 minutes to play. Jack Ross' men join United and Queen of the South on nine points, and sit third in the Championship table, while the Terrors' inferior goal difference means they drop to fourth. Match ends, St. Mirren 3, Dundee United 0. Second Half ends, St. Mirren 3, Dundee United 0. Stewart Murdoch (Dundee United) wins a free kick in the attacking half. Foul by Jordan Kirkpatrick (St. Mirren). Mark Durnan (Dundee United) wins a free kick on the left wing. Foul by Ross Stewart (St. Mirren). Foul by Scott McDonald (Dundee United). Gregor Buchanan (St. Mirren) wins a free kick in the attacking half. Substitution, St. Mirren. Ross Stewart replaces Gavin Reilly. Substitution, St. Mirren. Darren Whyte replaces Lewis Morgan. Paul Quinn (Dundee United) wins a free kick in the attacking half. Foul by Gavin Reilly (St. Mirren). Attempt saved. Stewart Murdoch (Dundee United) right footed shot from outside the box is saved in the centre of the goal. Substitution, St. Mirren. Jordan Kirkpatrick replaces Liam Smith because of an injury. Patrick Nkoyi (Dundee United) wins a free kick in the defensive half. Foul by Gregor Buchanan (St. Mirren). Goal! St. Mirren 3, Dundee United 0. Ian McShane (St. Mirren) right footed shot from outside the box to the top left corner. Assisted by Lewis Morgan. Attempt missed. Scott McDonald (Dundee United) right footed shot from outside the box is close, but misses to the left from a direct free kick. Billy King (Dundee United) wins a free kick in the defensive half. Cameron Smith (St. Mirren) wins a free kick on the right wing. Attempt saved. Cameron Smith (St. Mirren) right footed shot from the left side of the box is saved in the top centre of the goal. Corner, St. Mirren. Conceded by Mark Durnan. Cameron Smith (St. Mirren) wins a free kick in the defensive half. Attempt saved. Cameron Smith (St. Mirren) right footed shot from outside the box is saved in the bottom left corner. Attempt missed. Paul McMullan (Dundee United) right footed shot from outside the box misses to the right from a direct free kick. Adam Eckersley (St. Mirren) is shown the yellow card for a bad foul. Substitution, Dundee United. Patrick Nkoyi replaces Fraser Fyvie. Attempt missed. Samuel Stanton (Dundee United) left footed shot from outside the box is just a bit too high. Attempt missed. Stephen McGinn (St. Mirren) left footed shot from outside the box is close, but misses to the left following a corner. Corner, St. Mirren. Conceded by Willo Flood. Corner, St. Mirren. Conceded by Fraser Fyvie. Corner, St. Mirren. Conceded by Jamie Robson. Corner, Dundee United. Conceded by Cameron Smith.